A comprehensive eye examination at Berks Eye Physicians & Surgeons involves a series of tests designed to evaluate your vision and check for eye diseases. 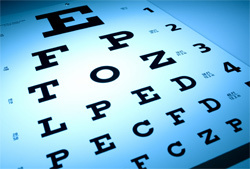 Each test is necessary and allows your doctor to evaluate a different aspect of your vision. External Eye Exam: Your doctor will check your eyes using a light to ensure the exterior parts of your eyes are functioning correctly. In an external eye exam, your eye doctor checks: Your pupils to see if they respond normally, position and movement of your eyes, eyelids and lashes, your cornea and iris for clarity. Visual Acuity Test: This test measures how sharply or clearly you can see something at a distance. Your doctor will ask you to identify different letters of the alphabet off a chart positioned usually 20 feet away. The lines of type get smaller as you move down the chart. You cover one eye and read aloud, then cover the other eye and read aloud. Your doctor monitors how well you can identify the letters. Your visual acuity is expressed in a fraction – such as 20/20 vision. The top number refers to your distance from the eye chart, usually 20 feet. The bottom number indicates the distance at which a person with normal eyesight could correctly read the line you read. For example, 20/20 vision means that you can see objects clearly from 20 feet away that a person with normal vision could see clearly from 20 feet away. Refraction Assessment: Refraction refers to how light waves are bent as they pass through your cornea and lens. A refraction assessment helps your doctor determine a corrective lens prescription that will give you the sharpest vision. Your doctor will have you look through a phoropter, a devise that holds many lenses, and determine which combination of lenses may give you the sharpest vision. Slit Lamp Examination: A slit lamp allows your doctor to see the structures at the front of your eye using a microscope with an intense line of light to illuminate your eye. The slit lamp allows us to examine the cornea, iris, lens and anterior chamber of your eye. Retinal Examination: A retinal examination examines the back of your eye, including your retina, optic disc, choroid and blood vessels. We may use special eye drops to dilate your pupils, opening them wider so that we can see the back part of your eye. The effects of these drops will not wear off for several hours. Your vision will be blurry, and you’ll have trouble focusing your eyes. Depending on your job, you might not be able to return to work immediately after your exam. Your eyes will also be very sensitive to the light so we recommend using sunglasses. 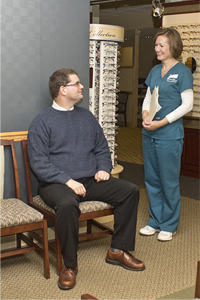 Any questions about your vision concerning glasses, contacts, laser surgery, etc.